About Us A Home to Envy, LLC. My name is Kris Henry; I am the owner/contractor of A Home to Envy, LLC. After looking at my website, I thought that rather than the generic, third person, view of “us” that I had previously written, the “About Us” section should be revised to tell you who “we” really are and how this business came to be. I originally came to Reno to attend THE University of Nevada right out of high school from a small town called Lakeview, Oregon (Go Honkers!) I instantly fell in love with Northern Nevada. During my freshman year of college, I met my wife Jamie, who now owns her own law practice in Reno. We have been married for 5 years and live in Sparks where we are raising our daughter, Brooklyn and anxiously awaiting our son in early February of 2014. I started A Home to Envy in 2009 when the construction industry was in the tanks. I was tired of constantly being laid off due to lack of work. I obtained a C3 contractor’s license and started taking any and all work I could get my hands on - from caulking windows to cleaning to moving furniture….I did EVERYTHING! Eventually, the projects starting getting bigger and the work started to become more fun, and slightly more lucrative. 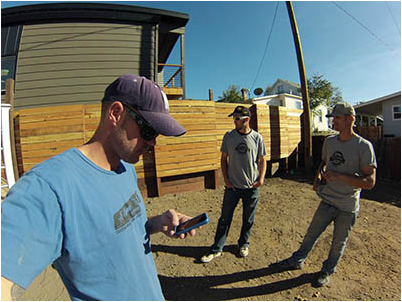 I now have two AWESOME full-time employees and no shortage of projects, from decks and patio covers to remodels and…. Now business is booming and I am having more fun than ever. I am on the verge of hiring more employees, and really excited about expanding our business. I have been flipping houses, designing custom furniture, remodeling homes and building unique decks/patio covers with custom designs specific to each customer’s imagination and budget. Sample ideas: backyard office, playhouse, play house, treehouse, tree house, deck, patio cover, composite deck, redwood deck, reclaimed wood, green building, siding, windows, doors, mancave, man cave, yoga studio, dance studio, music studio, pergola, planters, rustic décor, rustic design, shop, garage, remodel, hobby shop, castle, reno, sparks, carson city, minden, Gardnerville, "Reno deck builder", "reno tree house builder", "reno home office"